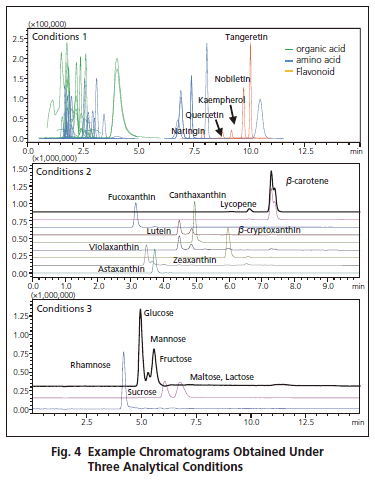 Metabolomics refers to the technological field wherein the target analytes are small molecules involved in sustaining of life such as organic acids, amino acids, sugars, vitamins, carotenoids and flavonoids (these are collectively called the metabolites). It is increasingly performed in the food industry because quantification of these metabolites helps to objectively characterize the favourable attributes of food, which is needed for developing a better product or strain. 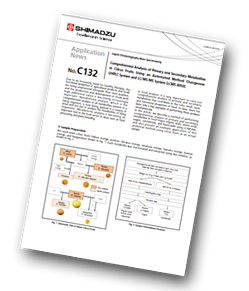 In this application note three different columns and chromatographic conditions were needed to cover the wide range of molecules. The system was configured with a column-switching valve and solvent changer so that the solvent lines and columns were automatically purged and equilibrated to allow the methods to be run seamlessly on the same system. The results demonstrated that high abundance of carotenoids in flesh was the characteristic feature inherited by species and strains in the taxonomic tree of Citrus unshu (Satsuma/Mikan) and Citrus reticulate (Mandarin orange). Such indication may be useful in making a strategic approach to developing a new strain with better characteristics.